Spiral concentrators are modern, high capacity, low cost units developed for the concentration of low grade ores. Spirals consist of a single or double helical sluice wrapped around a central support with a wash water channel and a series of concentrate take-off ports placed at regular intervals along the spiral. To increase the amount of material that can be processed by one unit, two or more starts are constructed around one central support. New spirals have been developed that do not use wash water. These new units have modified cross sections and only one concentrate-take-off port, which is located used for the processing of heavy mineral-bearing beach deposits in Florida and Australia. The first commercially applied spirals were the cast iron Humphreys spirals introduced in the early 1940s. These units A modern Humphries spiral concentrator. From were very heavy and difficult to adjust. In addition, rapid wear of the rubber lining and irregular wash water distribution resulted in major production problems. Although still in use, the Humphreys cast iron spirals have been largely superseded by a variety of other types, notably the fiberglass Reichert spirals and new, lightweight Humphreys spirals. The processes involved in mineral concentration by spirals are similar for all models. As feed containing 25-35% solids by volume is fed into the channel, minerals immediately begin to settle and classify. Particles with the greatest specific gravity rapidly settle to the bottom of the spiral and form a slowmoving fluid film. Thus the flow divides vertically: one level is a slow-moving fluid film composed of heavy and coarse minerals; the other level, the remainder of the stream, is composed of lighter material and comprises the bulk of the wash water. The slow-moving fluid film, its velocity reduced by friction and drag, flows towards the lowest part of the spiral crosssection (nearest the central support) where removal ports are located. The stream containing the lighter minerals and the wash water develops a high velocity, and is thrust against the out side of the channel. Separation is enhanced by the differences in centrifugal forces between the two: the lighter, faster flowing material is forced outward towards the surface, and the heavier, slower material remains inward towards the bottom. Spiral concentrators are capable of sustained recoveries of heavy minerals in the size range of 3 mm down to 75 microns (6 to 200 mesh). They are suitable for use as roughers, cleaners, or scavengers. Feed rates may vary from 0.5 to 4 tons per hour per start, depending on the size, shape, and density of the valuable material. Some factors that affect recovery are the diameter and pitch of the spiral, the density of the feed, the location of splatters and take-off points, and the volume and pressure of the wash water. Individual spirals are easily monitored and controlled, but a large bank of spirals requires nearly constant attention. Advantages of spiral concentrators include low cost, long equipment life, low space requirements, and good recovery of fine material. They can also be checked visually to determine if the material is separating properly. For maximum operating efficiency, feed density should remain constant, the particlesize distribution of the feed should be uniform, and fluctuations in feed volume should be minimized. Spiral concentrators will tolerate minor feed variations without requiring adjustment. 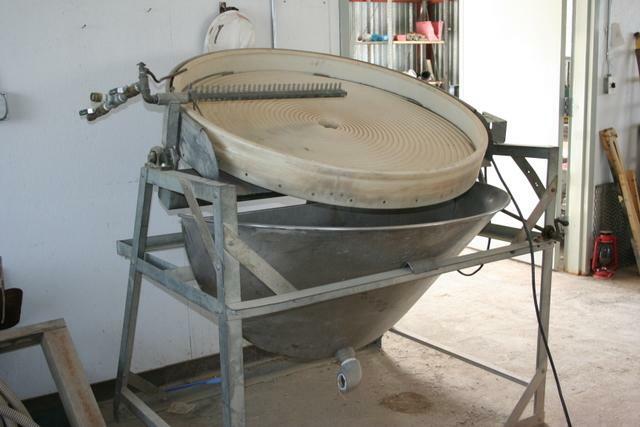 An interesting variation of the spiral concentrator is the rotary table. This device is available from a variety of manufacturers under many trade names. Basically, the rotary table consists of a flat, circular plate in which a spiral pattern has been molded or cut. It is usually mounted on a frame with a wash water bar running laterally from the one side to the center. When operating, the unit is tilted upward and the table is rotated clockwise. Material is fed in on the left side. 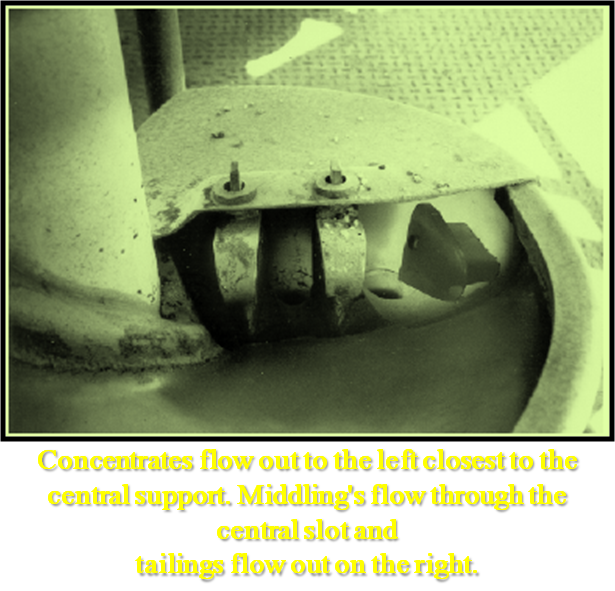 Tailings are washed over the bottom lip, while concentrates are carried towards the middle and flow through the discharge. The rotary table concentrates material through a combination of gravity separation and fluid forces. As the table rotates, wash water forces light material downward. over the spirals. 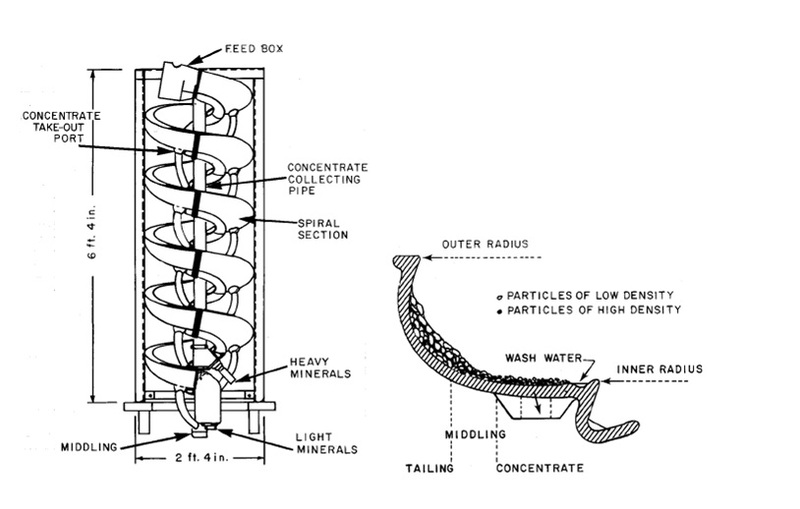 The centrifugal force generated by rotation forces heavier material into the troughs of the spirals where the washing action of the water is minimal. In some machines, the spiral pattern varies in height much like the tapered riffles on shaking tables. The higher initial spirals allow the heavy material to settle. 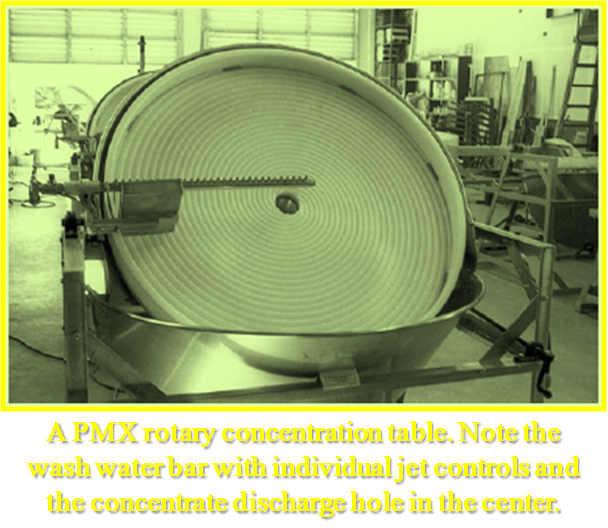 The shortening of the spirals towards the center of the table allows wash water to clean the concentrate before discharge. flow will remove less light material, reducing the density of the final concentrate. For more control in concentration, Precious Metals Extraction (PMX) puts individual controls for each jet of water on the wash water bar. These controls allow the operator to adjust individual wash water jets for maximum effect. In a test of a PMX table, an independent laboratory (Golden State Minerals, Inc., Auburn, California) separately processed 3 pounds of black sands screened to minus 20 mesh (.85 mm) and 200 pounds of gravel screened to -1/4 inch. These samples were amalgamated and were observed to contain mercury droplets smaller than 500 mesh (30 microns). Results show the PMX rotary table recovered 99.91% of the mercury contained in the black sands and 99.95% of the mercury contained in the gravel. Microscopic examination of the tailings revealed a trace of -500 mesh (30 microns) mercury (Cassell, 1981). Rotary tables are very efficient cleaners. Their low capacity limits their use as roughers.